Mary Engelbreit Biscornu pin cushion hand cross stitched on Aida 14 count with DMC floss. 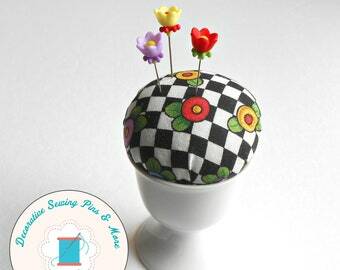 This whimsical pincushion was created using Mary's class fried egg flower pattern. Both sides of the pin keep have a different pattern. Choose the side that you want displayed. 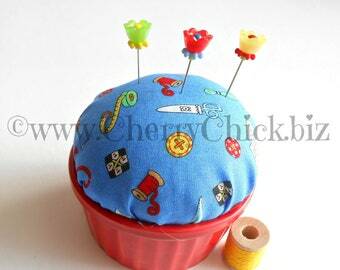 This handcrafted pincushion is filled with polyester filling. 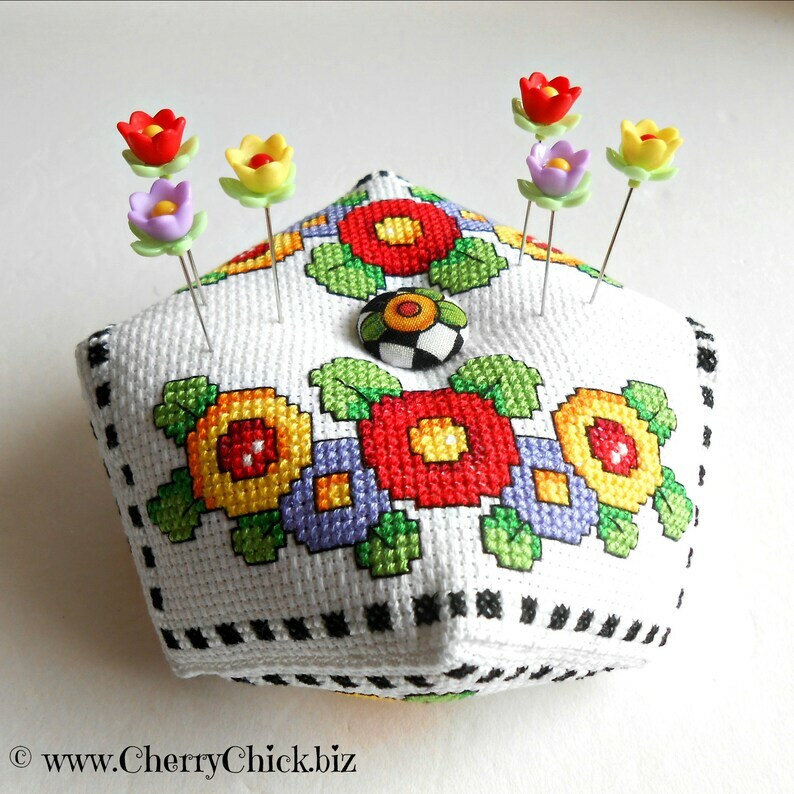 The center is tufted on both sides with Mary's FEF fabric covered buttons. 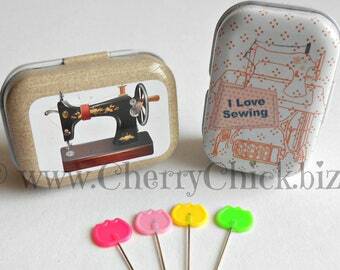 Please select from the drop down menu which sets of pins that you would like as I offer two choices. 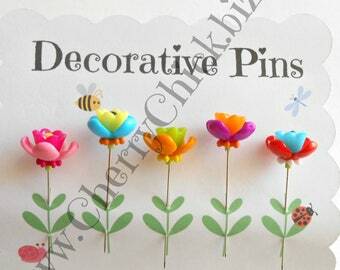 One group has a set of six double flower pins and the other is a set of five flower pins in bright primary colors. 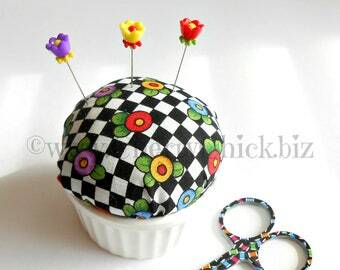 A biscornu is an octagonal pincushion, originating in France, where the name means “quirky”, “skewed” and “irregular”. 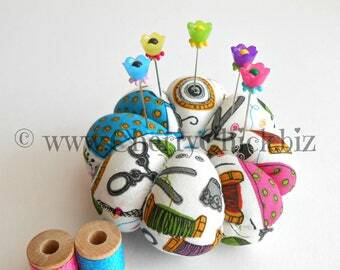 Most people consider biscornus to be curious oddities and cute keepsakes. 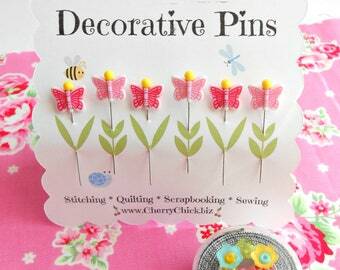 6 or 5 floral decorated pins included depending on which design you select. 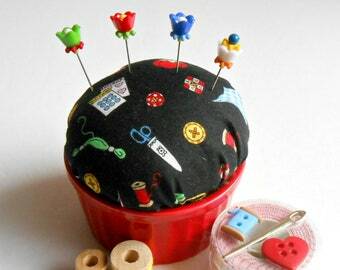 This listing is for the pincushion with one set of decorative pins only. Some photos contain other items that I sell in my shop that have been used as photo props in this listing.